Explanation: If a star in this photograph twinkled slightly, would anyone notice? Would anyone care? Astronomers with the MACHO Collaboration noticed one such twinkle just last week, and many members of the astronomical community now care. The specific type of sparkling of the SMC star in the above cross-hairs clearly indicated a multiple-star microlensing event was in progress. 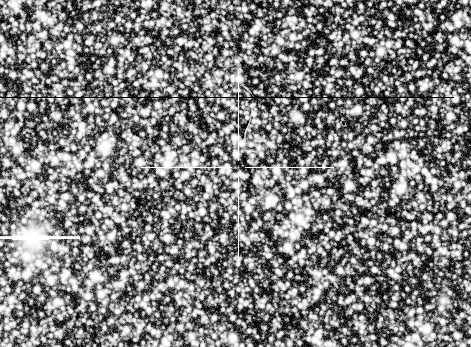 Microlensing is a rare phenomena where gravity itself deflects light so prominently that background sources might appear to have many images and appear many times their normal brightness. Study of the precise details of the latter part of this microlensing event might reveal the mass and distance to the lenses. Were these lenses in the outer reaches of our Galactic halo, this would add evidence to some controversial indications that a good fraction of the normally unseen matter in our Galaxy is composed of lenses only slightly less massive than our Sun.